I am attempting to make the case that today, the musician (or artist) is today’s evangelist. Now I can hear one of my friends mentally thinking right now, “Well, it depends what you mean by evangelist”. Indeed it does. For years I have not been convinced that the motivation of every convert at a Billy Graham crusade was forgiveness of their sin and joining God’s narrative of redemption of all of creation. It seems clear to me that each person comes to Jesus from a different context and a different part of the gospel appeals to them more. Those that are in need of healing (physical, emotional) look to Jesus the Healer. Those guilt-ridden from a list of sins that have haunted them for years seek Jesus the Forgiver. The meaning-seeker sees Jesus as the mediator between her and God. Some even identify with Jesus the lover of people and while they acknowledge their sin, they are even more moved by the inspiration of Jesus. And then there are some who don’t care about Jesus at all but know they prefer heaven over hell. That’s probably a very, very, very small percentage but let’s call them “Jesus the free ticket to heaven because I sure don’t wanna go to hell” believer. Now it is not the purpose of this post to determine which motivations for conversion and discipleship are authentic (although our sarcastic spirits can probably figure some of that out), I do want to equal the playing field here when we question the motives of those like Bono or Jars of Clay or some other musician. But when these musicians’ activism brings clean water to a group of people, is that not true mission work? To some, mission work only happens if there is a “true gospel” presentation and while I certainly believe that we are to share about the crucifixion, resurrection and the way of Jesus, etc., I think too many evangelicals have largely missed the importance of things like clean water initiatives in places like Africa and addressing the needs here in our own communities. I imagine a conversation with a missionary saying to a thirsty African: “You need Jesus, the Living Water! See, it’s spiritual”. Missionary: “You’re misunderstanding – Jesus has the water”. Thirsty African: “Oh that’s great! Where’s Jesus, because my family and I really thirsty”. Sometimes I feel as an evangelical missions movement saying, “It’s too much trouble to help feed and clothe you, so you will probably die before we can do this efficiently. But die with Jesus. We love him, so should you. He has done so much for us and if you believe in this name that you have never heard of, you will thank us on the other side of eternity.” This is what I am interpreting some saying. I think that’s a very poor approach to missions, the gospel and the call to the Christian life and I hate to say it (I really do) but I think some of our artists are doing more for the Kingdom than some of our “missionaries”. Last week, a few friends and i got together and among many things, we got to talking about Billy Graham and Bono. 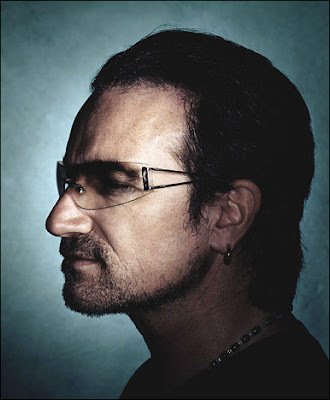 I made the argument that to many, Bono is our generation’s Billy Graham. If you are a U2 basher, just hold on (or go listen to Lady Gaga or something) but hear me out. Admittedly there are significant character differences, certainly Bono is cooler, and certainly Billy Graham was more influential to the Protestant Church but a case could easily be made for Bono inspiring more people outside the church. Is that not huge part of the job description of an evangelist? It started after reading this article from this month’s Christianity Today cover story how about bands like Jars of Clay have become so involved in mission work. The article stated that using music in mission work was not new by mentioning “In 1883, gospel singer Ira Sankey joined evangelist Dwight L. Moody in Edinburgh to raise £10,000 (equivalent to $373,000 today) to build a permanent home for Carrubbers Close Mission—which still offers the homeless a free breakfast on Sundays.” While this is a great story something tells me that we are not comparing apples to apples here. I could be wrong but during their touring, I am fairly sure that the crowd was coming to hear Moody. I mean really, which name do you recognize between the two? 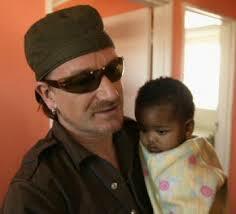 The article went on to say that musician-led activism has greatly increased and soared in 2002 with Bono’s work. This got me thinking. More than 100 years ago it was the musician who accompanied the evangelist, today it seems the musician is the evangelist. Overstated right? Can you tell me the name of a real evangelist right now? Oh I know, we do evangelism differently these days, we have broadcast evangelists. Which one is your favorite? Bono is mine. Continued tomorrow. Went to a videocast at a church near by to hear Bono speak on Aids. Granted, I like the music of U2 a lot, I do believe that I still would have gone had it been someone else, (afterall, I listened to the Compassion International guys and there not near as cool). It is interesting that a artist/celebrity of this type isso interested in this issue. It could be he is as person too. Could celebrities be actual people too? Well, maybe some. The videocast was an interview between Bono and Bill Hybels (the pastor at Willow Creek) that was shown during the Leadership Summit earlier this year. There has been a great deal of difficulty showing this interview due to legalities and such and I believe that things should be done justly and rightly and well and all that. At the same time, I hope more people get to see this interview. It would be contradictive to the spirit of the interview. It easier for us to grasp revenge, or atonement then grace. – We are confounded by some of our prayers remain unanswered, but no prayer is unanswered. Sometimes the answers are no. We can endure and comfort ourselves through the Scriptures. – Jesus was either an absolutely nutcase or who He said He was. – Love your neighbor is not advice, it’s a command. Find out what God is doing because it is already blessed. – Data did not begin out of charity but out of justice. Africa was paying the US back more then they were receiving us. What else are you going to do with this thing called celebrity? It’s ridiculous but its currency. Peace that passes understanding at the center of yourself, but do not be at peace with the world. Accident of latitude determines whether we live or die. Bono, in a recently released 1981 presentation to a weekend retreat for Christian musicians with fellow band members the Edge and Larry Mullen Jr.